JNTU Kakinada: Jawaharlal Nehru Technological University, Kakinada, is one of the well reputed and leading universities for Engineering. It is commonly known with its short names JNTU Kakinada or even more shorter JNTUK. JNTUK is UGC, NAAC, AIU affiliated university located in Kakinada, Andhra Pradesh. JNTUK is a Public University which has been accredited by NAAC of UGC with an “A” Grade. In JNTUK there are more than 5000 students studying in various courses. JNTUK or JNTU Kakinada provides admission into B.Tech, B.Pharmacy M.Tech, MCA, MBA, M.Pharmacy, and various Pre-PhD and Ph.D. courses. To keep you up-to-date about the events of JNTU Kakinada, we are preparing this article to provide all JNTU Kakinada Latest Updates about JNTUK really quickly. Trust on Chekrs Team, We will not only provide you the JNTUK Fast update but we will maintain Quality and reality in our Updates. Here is the JNTUK Latest Updates table it covers updates from Admission to the JNTUK B.Tech 2-1, 2-2, 3-1, 3-2 Result, We are waiting for Timetables and other parts and we will include them as quick as possible. JNTUK Conducts Most of UG Courses exams Semester wise. You can Find your Result, timetable, notification in this way In the table if JNTUK B.Tech 2-1 Result has been written it means B.Tech 2 year 1 sem or odd sem, hence Similar for other courses. JNTU Kakinada University offers Courses/ Education in semester wise. Course’s each year is divided into 2 semesters i.e. 1st sem and 2nd sem. It conducts examination for 1st sem in March Month and for 2nd-semester exams In November/ December Months. 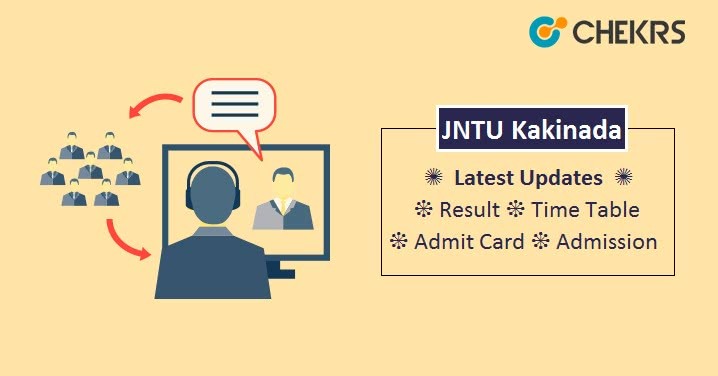 JNTUK is going to release Its Semester Exam timetable for August so we will see some updates really soon on the JNTUK Official Website jntuk.edu.in and then here in the table, so keep yourself connected with us. Some of the JNTUK Kakinada upcoming exam events can be announced very soon are Given Below. JNTU Kakinda was established in 1946, now it is a very reputed university in the field of Engineering. The Jawaharlal Nehru Technological University Kakinada (JNTUK) is one of the biggest universities of Andhra Pradesh and 2000+ colleges are affiliated to JNTUK Kakinada. It provides quality education and organizes various activities for students and that’s why every year the rate of new admissions are increasing in it.